Kato, left, makes a statement with polka-dot blazer and bold red scarf while attending a NYFW 2012 runway show. 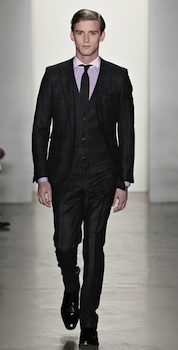 The type of look Kato liked most from NYFW: a classic, well-tailored suit with a hint of English styling. This ensemble is from Simon Spurr's "Distinguished Gentleman" collection. Photo by Thomas Kletecka. Man Up Chicago: Much of men’s fashion over the past several years, especially fall fashion, has consisted of rugged clothes inspired by workwear combined with very modern and precise tailoring. Is that what men should continue to expect this upcoming fall, or did you see designs that went a different direction? Kato: There was a little puffy, outdoorsy type looks (maybe Eddie Bauer might be back in fashion) but most were classy tailored pieces. I’d say a lot of movement to the well dressed man, almost British (Downton Abby) direction. I know we had seen a lot of military influenced designs the last few years but now I feel the trend is going to being classically well dressed with different textures and colors like leather or green jackets. MUCh: Fall clothes are typically neutral colored, but did you see anything you liked that used loud colors? Kato: There were definitely more red and browns but some of the shows had some color – albeit subdued. I think they use colors as accents and this year was more colorful especially with color pants coming back in. I’d say the Pop Luxe show probably had the most colorful set I saw. MUCh: What’s the one look or outfit you saw that you’ll definitely try to emulate this fall? Kato: The well dressed man look. I think as guys in general, we’ve been slacking on looking sharp and it does make all the difference. Normally I get a few people during the week who’ll ask to take pictures with me but this time I wore a J.Cheikh jacket and everywhere I went girls were asking to take pictures with me. A well tailored jacket put together in a complete outfit is going to turn heads this fall. MUCh: What’s the one look you saw that you would not try to pull off? Kato: General Idea had these winter ski bum looks that don’t work at all. I love skiing and I’ll wear that on the slopes but that look doesn’t work anywhere else. MUCh: Jackets of all varieties are usually a big part of fall fashion collections. Was there a particular one, or a particular style of jacket that really stood out? Kato: The double breast seems to be creeping back. It stands out among the majority of jackets but I’m not really feeling it. I look at pictures 15 years ago and see the double breast and it just doesn’t work. Maybe on a coat or a military uniform but I’m not going to buy a double breasted jacket and think I look good. Otherwise, there is just variation in the textures of the fabrics, which is cool but the men’s style doesn’t change all that much. A classic Burberry raincoat modeled at the recent NYFW. MUCh: If you could only buy one item for the coming fall, what would it be? Kato: A coat. 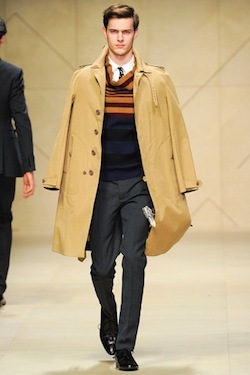 The coats I saw were like the old London Fog raincoats or the classic Burberry raincoat only with slight variation. I’m going to the classy three piece Fred Astaire look with a mix of British properness. MUCh: Besides the clothing being displayed, how was this New York Fashion Week different from the one you attended in the fall? Was it busier? Were there more big names in attendance? Kato: February is smaller although all the industry people are there. There are less celebrities and glitzy parties with the focus more on fashion although NYC will take any excuse to party. MUCh: Finally we have to ask: You were in NYC during the rise of Jeremy Lin. It seemed like everyone was talking about it. Were people around the fashion shows as enamored with the story as the rest of New York? Kato: I honestly didn’t hear any talk about him at fashion week but I don’t know how much the industry values humility or sports. That being said, I was hoping to get a free night to go see him at the Garden but it didn’t work out. I’ll have to make a trip out there just for that.